quick (fast) checkin | doberman pizza. 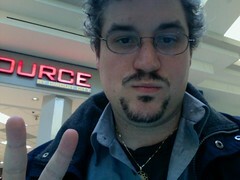 lol, blogging at the mall. the Fast has gone pretty well so far, except that I’m really tired—but then, that was happening since before the Fast. I think winter, short of making me depressed this year, has left me in rather pitiful physical shape. maybe I can blame the bus strike for not letting me get to the gym regularly… uh, anyway, excuses aside… I spent a couple of days at the beginning sick with a sinus cold, and thus unable to fast. It always really irritates me when that happens. shortly afterwards, I paid a visit to Craig and Geneviève in Victoriaville, which is always like a drink of life-giving waters. we had a chance to chat about my upcoming trip to Vietnam, and they gave me a lot of tips and encouragement about Vietnam and travel in general. For the rest of you out there who are fasting, I strongly recommend you follow the blog nineteen days, maintained by a couple of Baha’is with photographic skills and an eye for the poetic. They’re into their second year of blogging their fast and are now featuring guest bloggers each day this year, making it an even more interesting and engaging read. That’s it for now… off to help with Ruhi Book 3. This entry was posted in asia chronicles, baha'i blog, journal and tagged blogs, fast, vietnam by danger. Bookmark the permalink. Thanks for recommending a blog. And, you are allowed to use any excuse you want for not getting to the gym. You live in cold country. I have no excuse since I live in sunny CA. My excuse is work. How did you Vietnam trip end up going? I hear it’s a beautiful country.